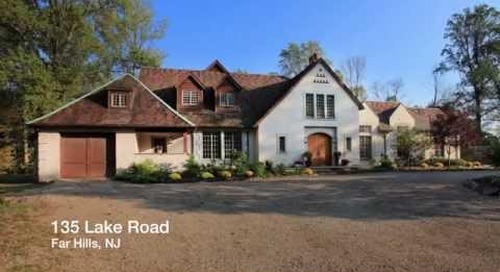 For more information visit http://www.turpinrealtors.com/property/22459962/4-Timber-Ridge-Rd-Mendham-Twp-NJ-2320 The custom English country manor, "Stone View," designed by Jeffrey Beers, was chosen Best Custom Home of the Year in 1999 by the New Jersey Home Builders Association. This is your opportunity to live in privacy and yet enjoy one of the most-coveted neighborhoods in New Jersey. "Stone View" is enclosed by gorgeous, professional landscaping with large Tennessee gray stone terraces and backdrop stone boulders. This serene setting is hidden from sight along the quiet cul de sac on which it is located. It offers three levels of opulent living space, providing every amenity within and without. Minutes from the Gladstone train, major highways and excellent schools, this architectural gem is sure to satisfy all of your expectations and needs. A classic yet custom design is perfect for the most discerning buyers. Artisan craftsmanship radiates from every corner of the home, which features unique ceilings, rounded wall corners, oak flooring with mahogany inlays, marble fireplaces, wainscoting and the finest in lighting fixtures. Providing the ultimate in comfort are six bedrooms, seven baths and a heated three-car garage. The gourmet kitchen has Tuscany farm-style handcrafted cabinetry by leading designer William Ohs. A six-burner dual fuel 30-inch Viking range and oven is backed by a granite wall. Located on opposite wings of the first floor are the master suite and guest suite. The master suite boasts a two-sided marble insert floor-to-ceiling fireplace between the bed chamber and wonderful sitting room which is a six-sided semi-circular living space. Exquisite floor-to-ceiling windows with Luminette drapes and heated floors enhance the comfort and beauty of this area. Outside, the heated Gunite pool presents a four-level waterfall with accent and underwater lighting surrounded by the most beautiful trees and plantings, transporting you to a lush paradise. The magnificence of this English country manor is evident on every level. Careful construction took two years, resulting in a premier dream home. 4 Timber Ridge Road in Mendham, New Jersey, with a Far Hills mailing address, is certainly a very special and unique estate. Hidden within the loveliness of its five± acres, this exceptional property is an architectural masterpiece certain to be appreciated by all who enter its portals.